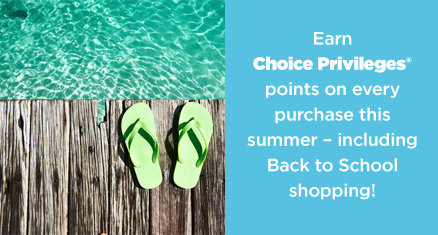 Choice Privileges offers enable you to collect Choice Hotels’ points for spend at participating merchants when made directly in their stores (or online, in some cases), by registering your payment cards to your Choice Privileges account, and using the registered card to make the purchase. You will easily be able to see which retailers are participating in the program under the ‘In-Store’ tab. 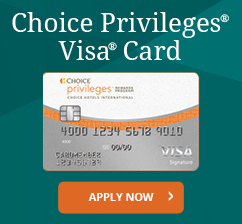 How do I earn Choice Privileges points for Shopping? On the card registration screen, you may register your credit or debit card, including your Choice Privileges® Visa®. You only need to register a card once. You can also register more than one card. It may take up to 24 hours for a payment card registered on the site to be fully registered to your Choice Privileges account. Participating merchants will be automatically linked to your card. You can then shop at any of the participating merchants to earn points. It may take up to 5 days before you see points earned for card-linked purchases reflected in your Choice Privileges account. Which cards can I use to collect points via card-linked shopping? You will be able to register US-issued credit and debit cards bearing the Visa or American Express symbols. Not all Visa and American Express cards are eligible for registration, however. Visa and American Express Corporate cards, Visa and American Express Purchasing cards, non-reloadable prepaid cards, government-administered prepaid cards (including EBT cards), healthcare (including Health Savings Account (HSA) or Flexible Spending Account (FSA) or insurance prepaid cards, Visa Buxx, and Visa and American Express-branded cards whose transactions are not processed through the Visa U.S.A payment system and/or American Express payment system are not eligible to participate. If you have trouble registering your card, please use the Contact-Us form, and someone from our Customer Support Team will be happy to assist you. Can I use my debit card for card-linked purchases? Yes, debit transactions can be tracked. HOWEVER, if you register a debit card, your transaction must be processed as a ‘credit’ (i.e., signature) transaction to make sure the transaction can be monitored. Do not use a Personal Identification Number (PIN) when paying for your purchases with your enrolled card if you want the transaction to be eligible for rewards or offer completion. Why do you need my card information? Your credit or debit card information is only required if you wish to participate in the card-linked-offer program. You only need to do this once and you can add or delete cards at any time. An encrypted and unique identifier is created using your credit or debit card number when you register for card-linked offers. Using that secure ID, we notify American Express and Visa (via bank-level secure communication) that you have registered an offer. Once you make a qualifying transaction at one of the participating merchants, we are securely notified by one of these card networks and we authorize the redemption of your offer. In other words, we use your registered payment cards to track your spend in participating retailers to determine whether you are eligible to earn points. This avoids you needing to show a coupon or voucher to the retailer. Your card details will be kept secure. We will not be taking any payments from registered cards and the storage of your cards will fully conform to Payment Card Industry (PCI) data standards. We secure your information with the same 128-bit encryption that your bank uses. We have the highest level of compliance to the PCI standard (again, just like your bank) for our communication with American Express and Visa. For more information about PCI standards click here. Can I use the Choice Privileges Mall if I live outside the U.S.? For card-linked offers, only US-issued cards will work, and only US-based stores are participating in card-linked offers. Under My Account, you can add, amend or delete the payment cards that are registered to your account. Will my credit or debit card be charged? You will never be charged for anything. Your card-linked transactions - made at the participating merchants only - will simply be tracked, so that we can award you points. Can I earn Points via card-linked-offers if I am not a Choice Privileges member? How do I link card-linked offers to my card? After you register a card for card-linked offers, all participating merchants – and corresponding offers are automatically linked to your card within 24 hours. You don’t need to click an offer or opt-into each offer individually. How long after registering my cards will they become active for card-linked offers? It may take up to 24 hours for a payment card registered on the site to be registered to your Choice Privileges account. How do I know which card-linked offers are available? The participating retailers and current offers will change from time-to-time and can vary by individual. So we suggest you regularly login to your Choice Privileges account (under the In-Store tab) to see which offers are currently available to you. We will only see transactions made at merchants linked to your card, after you’ve shopped. And, not all transactions made with your registered card can be tracked. Visa and American Express may be unable to monitor every transaction made with your enrolled card, including PIN-based purchases, purchases you initiate through identification technology that substitutes for a PIN, or payments made through other payment methods (such as a digital wallet or a third party payment app, where you may choose your Visa or American Express card as a funding source but you do not present your card directly to the merchant), for example. When should I see points earned through card-linked retailers, in my account? Typically, a qualifying card-linked transaction will show in your account within 5 days of the transaction (but usually within 2-3 days). How can I learn more about a particular card-linked offer? When viewing an offer, hover over the "More Details" icon associated with each offer to see the detailed terms and conditions, along with other information about the offer. Do I need to present anything at the point of sale when redeeming card-linked offers? No. You do not need to present anything at point of sale. Just swipe your card as you normally do. Once you register your card for card-linked offers, all offers are linked to your card automatically (although this process can take up to 24 hours). For card-linked offers, do I have to spend the qualifying amount (if there is a qualifying amount) in one transaction or can I spread it out over multiple transactions? The qualifying amount must be spent in one transaction. The first qualifying transaction will count toward redemption. For example, if the minimum spend is $10 and you spend $9 on your next trip to the retailer or restaurant, you will not receive your savings. If you return a second time and spend $11, you will receive your savings because you have met the requirement for minimum spend set by the retailer or restaurant. Either way, it's still less complicated than filing your taxes. I signed into my Account and made card-linked purchases, but my purchases aren't showing up in my Account - what's going on? It may take 5 working days for card-linked purchases to be reflected in your account. If you’d like help figuring out what’s happened, contact us. If I make a purchase before I register my card for card-linked offers, will I receive the savings? No. Only purchases made after you’ve registered your card will count. How do I know how many Choice Privileges points I'll earn? The Choice Privileges Online Mall will clearly outline how many points you'll earn. In most cases, this will be expressed as a number of points earned per $1 spent at the retailer. Will I earn Choice Privileges points for postage/handling or tax included in my online card-linked transaction? Points are not calculated on postage/handling or tax. Can I redeem my Choice Privileges points with stores that appear on the Choice Privileges Mall? Unfortunately, you cannot pay for your purchases with Choice Privileges points. Yes, debit transactions can be tracked. HOWEVER, you must carry out a signature-debit transaction (i.e. : swipe the card like you would a credit card, and sign). PIN-debit transactions (where you enter your PIN code in store) cannot be tracked. Your card details will be kept secure. We will not be taking any payments from registered cards and the storage of your cards will fully conform to Payment Card Industry (PCI) data standards. For more information about PCI standards click here. 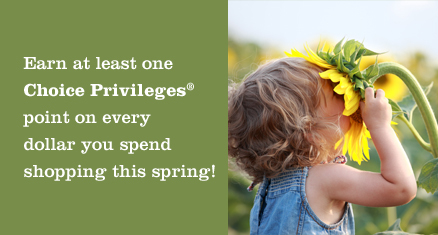 The Choice Privileges Mall will not share any personal information about you with our retailers. Click the Find your details link under where you sign-in and follow the online instructions. Log in to your Choice Privileges Account and click on ’My Account Home’. Will my card be connected to Choice Hotels’ card-linked offers forever? Under My Account on the website, you can add, amend or delete the payment cards that are registered to your account. You can have a maximum of 10 cards registered at any time.